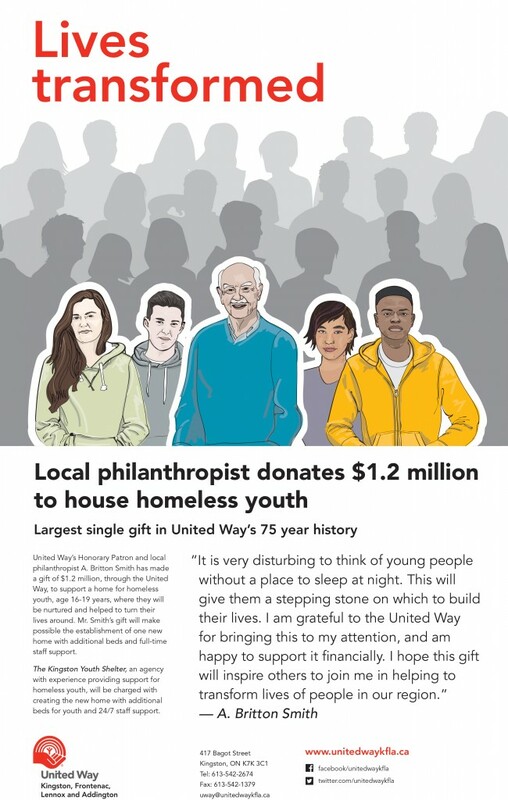 Kingston, ON – United Way’s Honorary Patron and local philanthropist A. Britton Smith has made a gift of $1.2 million, through the United Way, to support a home for homeless youth, age 16-19 years, where they will be nurtured and helped to turn their lives around. Kingston has one of the country’s highest proportions of youth in its city shelters. One third are young people. The national average is one in five. More transitional and supported housing for young people is urgently needed, and Mr. Smith’s support will make a significant difference. The United Way has been working with local agencies, funders, partners and volunteers to coordinate a local initiative to end youth homelessness in Kingston and area. 2016 marks the 75th year of the United Way in Kingston. Mr. Smith’s donation is its first million-dollar gift.